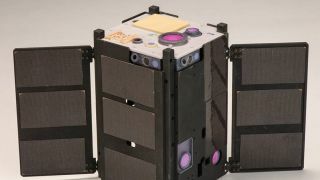 NASA's compact CubeSats have phoned home to confirm they're in orbit and ready to start communicating with Earth - and that means the space agency can begin testing the viability of getting broadband to and from space. You won't be able to ditch Sky or BT for NASA anytime soon, unfortunately, but this is another significant step towards a fully functioning system that could eventually provide downloads speeds of 200Mb/s for the people of our planet. The CubeSat network isn't the first broadband satellite communications system NASA has tested, but it provides faster speeds with smaller hardware. These satellites could eventually enable super-fast data transfers between people on Earth and astronauts in space. The likes of Facebook and Google are also busy building networks with drones and balloons that stay just inside the Earth's atmosphere. What makes NASA's initiative interesting is just how accurate and small these CubeSats are: the satellites measure just 10cm (about 4 inches) square. This same technology has many potential uses: deep-space communication, for example, and ensuring that spacecraft in orbit are correctly aligned and dock successfully with each other. NASA says the CubeSats will be "driving exploration" in the coming years. Over the next few months NASA is going to test the satellites' ability to communicate with Earth and with each other, while another batch of CubeSats are scheduled to head out of the atmosphere next February.